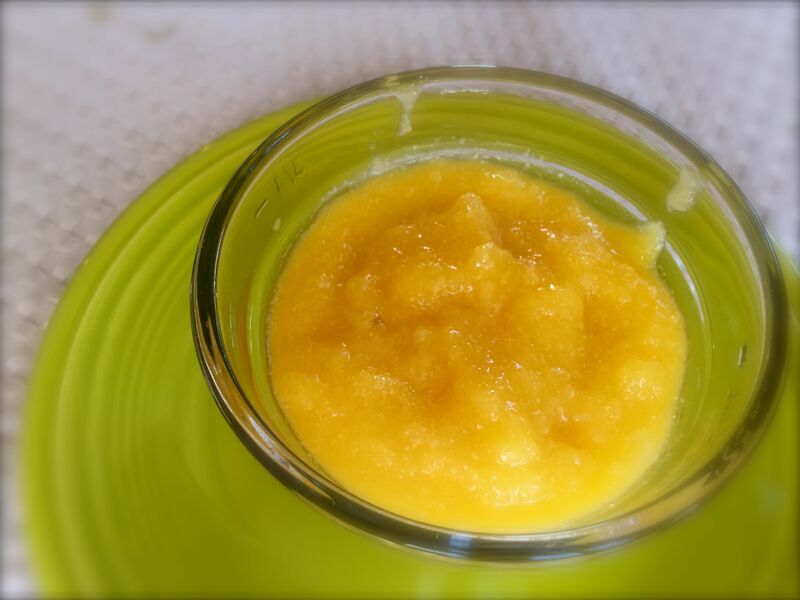 This apple sauce is really special. Not only it is delicious but it also contains belly healing properties. We know that fructose (sugars contained in fruits) can be hard on our liver and pancreas when eaten by themselves, especially if you suffer of diabetes, hypoglycemia or gut dysbiosis. We add two very special ingredients (I call them my secret weapon ingredients); coconut oil and gelatin. Not all brands of gelatin are made equal so we use Great Lakes Gelatin! Coconut oil will keep the opportunist flora in the gut at bay since it has antibacterial and anti fungal properties. It will also slow down fructose absorption given the pancreas and liver plenty of time to produce insulin and other hormones and enzymes. Gelatin will aid in healing and sealing the gut! This recipe is easy to make and very soothing to the all delicate bellies out there! In a food processor add a apples and magoes and process. Once you have a saucy consistency, add coconut oil and gelatin and process again until well combined.